SECONDS FROM RIVER!! This beautiful gulf access home with three bedrooms plus den, three baths, pool home is just what you have been dreaming of.Loaded with upgrades from travertine tile throughout (including lanai), high end GE appliances, impact windows and doors, custom wood cabinets, granite counter tops throughout, 14-fot ceilings, wet bar with cabinets, wine storage and custom sink, 10-foot pocket sliders to the lanai, and more!Plenty of storage in this home; the three-car garage is lined with cabinets and the trusses above garage were engineered to carry heavier loads. A separate storage room on the side of home was built to match home for even more storage.Step out to the large lanai that is well equipped with a Florida Kitchen including grill, hood, two-burner stove, refrigerator, storage and garbage.The new screen enclosure with no-seeum screening allows you to enjoy the heated saltwater pool and spa. 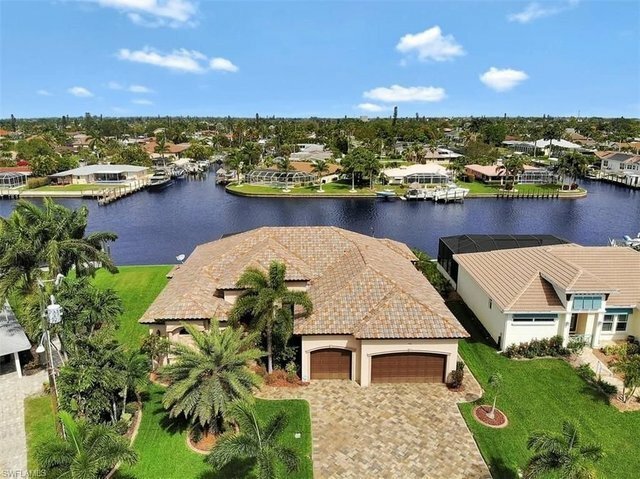 Down by the water is a custom built large dock with a 16,000-pound boat lift, water, fish-cleaning table, auxiliary 1,000-pound dinghy lift, 50 amp electric dock service, lighting, and room to park up to a 60-70' boat (6' draft).All this and a transferable home warranty. No expense was spared in this home.